Kathleen Duey grew up in Colorado. She loved riding her horses, hiking, being in the mountains. Reading was always important to her. Writing became a fascination early in her life. In the fourth grade, Kathleen began writing stories and told everyone who would listen that she was going to be an author. Then she did nothing about it until she was 35 years old. In the last decade, Kathleen has learned about computers, the internet, research and writing. Writing is her passion and her dream-come-true. She is in love and feels lucky to have a such a wonderful and loving partner in her life. For more information about her writing, visit Kathleen Duey’s website. CLICK HERE FOR MORE BOOKS BY KATHLEEN DUEY. A Resurrection of Magic — (2007-2008) Young adult. Publisher: Sadima lives in a world where magic has been banned, leaving poor villagers prey to fakes and charlatans. A “magician” stole her family’s few valuables and left Sadima’s mother to die on the day Sadima was born. But vestiges of magic are hidden in old rhymes and hearth tales and in people like Sadima, who conceals her silent communication with animals for fear of rejection and ridicule. When rumors of her gift reach Somiss, a young nobleman obsessed with restoring magic, he sends Franklin, his lifelong servant, to find her. Sadima’s joy at sharing her secret becomes love for the man she shares it with. But Franklin’s irrevocable bond to the brilliant and dangerous Somiss traps her, too, and she faces a heartbreaking decision. Centuries later magic has been restored, but it is available only to the wealthy and is strictly controlled by wizards within a sequestered academy of magic. Hahp, the expendable second son of a rich merchant, is forced into the academy and finds himself paired with Gerrard, a peasant boy inexplicably admitted with nine sons of privilege and wealth. Only one of the ten students will graduate — and the first academic requirement is survival. Sadima’s and Hahp’s worlds are separated by generations, but their lives are connected in surprising and powerful ways in this brilliant first book of Kathleen Duey’s dark, complex, and completely compelling trilogy. 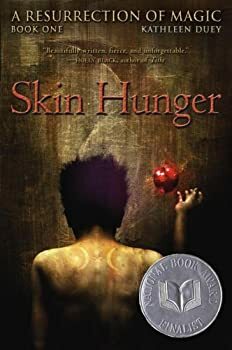 Skin Hunger is two stories in one. Told in alternating chapters, Skin Hunger follows the story of Sadima, a farm girl who can speak to animals. Her mother died when the magician hired to heal her instead stole the family’s few valuables and left her to die as she gave birth to Sadima. Seeking to find someone who can understand her abilities, she runs away to the distant city Limòri and starts keeping house for two budding magicians. The second story concerns Hahp, a young man sent to the Magical Academy in Limòri by a father who wants to get rid of him. Set several centuries after Sadima’s story, Hahp lives in a time where magic is strictly controlled by a secretive enclave of magicians. In any class of students, only one becomes a magician, and the other students are never seen again. 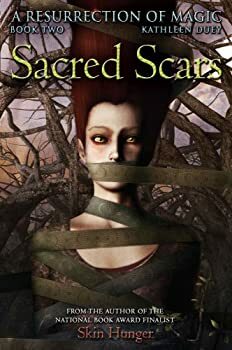 Sacred Scars, the second book in the A Resurrection of Magic trilogy, picks up immediately where the action in Skin Hunger leaves off. Told with the same style of focusing on the two main characters, Sadima and Hahp, in alternating chapters, the book starts with Sadima, Franklin, and Somiss living in a mysterious complex of caves and tunnels outside the main city of Limori, and Hahp trying to figure out how to survive the magical training he is undergoing at the hands of sadistic wizards. Kathleen Duey writes beautiful sparse prose that evokes a stark and terrible world while still illuminating quiet moments of peace and happiness. Back in 2007, Holly Black and Justine Larabalestier got in an argument about which fiction creature was superior — zombies or unicorns. Spurred on by that debate, they each recruited some of their author friends to write short tales in which they present the storytelling possibilities of the two mythic beasts. With header notes for each story in which they discuss the historical background for the different takes on the creatures, Holly Black heads up Team Unicorn, and Justine Larbalestier heads up Team Zombie.